Amiodarone, also sold under the brand names Cordarone® and Pacerone®, are extremely dangerous drugs that were FDA approved for the limited purpose of treating recurring, life-threatening ventricular fibrillation (VFib) but only as a last resort after all other treatments have failed. The reason for this narrowly approved use is the risk of death from recurrent, life threatening V-Fib outweighs the severe and potentially deadly complications from Amiodarone. But even then, Amiodarone is only to be used as a treatment of last resort after all other treatment measures have failed. However, the number of individuals suffering from life threatening VFib, for whom all other forms of treatment have failed, is extremely small. Because of this, the initial brand name manufacturer, Wyeth Pharmaceuticals, began an aggressive campaign to promote the drug to physicians as a “first-line” treatment for atrial fibrillation (AFib), a less serious but far more common form of heart arrhythmia. In contrast to the small number of individuals suffering from recurrent, life-threatening VFib, more than 6 million Americans suffer from AFib. Despite repeated warnings from the FDA to stop the misleading promotion of Amiodarone as a safe and effective treatment for AFib, Wyeth continued its marketing campaign. The Generic manufacturers not only capitalized on the market created by Wyeth, but continued the misleading promotion of Amiodarone as a treatment for AFib. This has resulted in millions of AFib sufferers being improperly prescribed Amiodarone, unnecessarily exposing them to the potentially deadly complications of Amiodarone when a large number of much safer treatment options were available. The most serious complication from Amiodarone use is pulmonary fibrosis/pulmonary toxicity which causes death in many sufferers. Other serious complications include blindness. Exacerbating this apparent disregard for safety, is the fact that Amiodarone was approved under a unique “special needs” approval process, allowing it to bypass the usual clinical trials to show the efficacy and safety of the drug required before FDA approval. This was due in part to the intent that this drug be used only on a very small group of individuals who otherwise would have no treatment for their life-threatening VFib. Nor did Wyeth Pharmaceuticals perform any post-market clinical trials to show the drug’s safety and efficacy, despite requests to do so by the FDA. Amiodarone is also one of a small number of drugs considered so dangerous that the FDA requires a special, direct warning be given to the consumer at the time of purchase. The FDA requires this warning to come in the form of a “Medication Guide.” The purpose of the Medication Guide is to ensure the patient is warned of the serious and deadly complications outside of the physician-patient relationship. The manufacturers of Amiodarone, along with the distributor and pharmacy, are under a duty to ensure that each patient prescribed Amiodarone receives the Medication Guide. Most Amiodarone patients we have spoken to have never received a Medication Guide, were not aware of any of these serious and potentially deadly complications, and were not aware the drug was never approved for use in the treatment of AFib. Indeed, the vast majority of Amiodarone prescriptions are not for the FDA approved use, but instead it is prescribed as a “first line” of treatment for patients with AFib. These individuals are the opposite of the intended users which are persons with life-threatening VFib for whom all other treatment options have failed (a treatment of last resort for VFib). These AFib patients, many of whom have debilitating and deadly lung diseases, should never have been prescribed Amiodarone, and if they had been given the required Medication Guide, would never have taken the drug. We have filed a number of lawsuits on behalf of AFib patients who developed pulmonary fibrosis/toxicity or blindness after being prescribed Amiodarone for treatment of the AFib. Amiodarone induced pulmonary fibrosis or toxicity is a potentially deadly complication from Amiodarone use. Our attorneys are knowledgeable about Amiodarone and the catastrophic complications that it can cause. Our Product liability attorneys would be happy to discuss the specifics of your case and whether you have a claim for compensation. You can call us toll free at 1-800-736-9085 or fill out this form. What are the differences between ventricular fibrillation (VFib) and atrial fibrillation (AFib)? Both are a type of abnormal heart rhythm called arrhythmia. The difference is AFib is an abnormal beating of the heart’s upper chambers or atria. Almost always, this is faster than normal rhythm and slower than normal. Typically, AFib is not considered immediately life threatening. VFib is the abnormal rhythm of the lower chambers (ventricles). Ventricular fibrillation is the most serious form of heart arrhythmia which can result in death in mere minutes if unless life-saving medical treatment is not instituted. Without immediate treatment, a person suffering from an episode of VFib will likely die within minutes. This drastic difference in the two arrhythmias shows why treatment of VFib is far more urgent and important. While VFib is far more life threatening than AFib, it is far less common. AFib is the most common type of arrhythmia and it is estimated that as many as 6 million people in the United States have atrial fibrillation. What are the side-effects of Amiodarone? Amiodarone has been linked to a litany of horrific side effects including causing blindness, disfiguration or discolorization of the skin and hypothyroidism-low thyroidism. Some patients even develop hyperthyroidism-high thyroid, which is more dangerous and more difficult to treat. 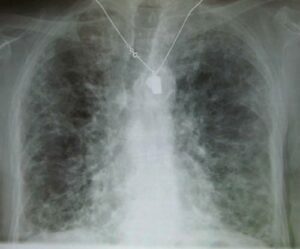 However, the most serious side effect of Amiodarone is pulmonary toxicity-lung disease. Amiodarone causes two types of lung disease — first, acute pulmonary syndrome, which looks and acts like typical pneumonia, with a sudden onset of cough and shortness of breath, a condition that typically improves once Amiodarone is stopped. The second type is more dangerous and life-threatening. This condition involves a gradual, almost unnoticeable, stiffening of the lungs that both the doctor and patient can overlook until irreparable and irreversible lung damage has been done. This condition can occur quickly after taking the drug or can occur years after the drug has begun. Amiodarone can have a devastating effect on the lungs: As many as 17 percent of patients in some studies experienced lung damage, and about 10 percent of them died. Patients taking the drug have suffered thyroid, liver and eye problems, including blindness, as well. What is Amiodarone induced pulmonary fibrosis / toxicity? These are progressive, life threatening lung diseases that can be caused by Amiodarone use. Both are classified as interstitial lung diseases because they impact the interstitial spaces in the lungs. Pulmonary fibrosis and cause the air sacs in the lungs (alveoli) to become thick, scarred and stiff making breathing difficult which leads to decreased oxygen in the bloodstream. The scar tissue is called fibrosis. As the alveoli become more scarred and stiff, the lungs lose their ability to transfer oxygen into the bloodstream, which means the body’s vital organs do not get the oxygen needed. The condition typically starts at the edges of the lungs then progresses inwards to the center. Typical symptoms include shortness of breath, exhaustion, rapid weight loss, and dry cough. Pulmonary toxicity is a broader term which includes pulmonary fibrosis as a symptom. Amiodarone induced pulmonary toxicity is defined as any of the following: pulmonary fibrosis, interstitial lung disease, pulmonary infiltrates, pleural effusion, pneumonitis and alveolitis fibrosis. In essence, it is a term to include a broader number of lung problems caused by Amiodarone. Amiodarone was approved by the FDA only as a drug of last resort for patients suffering from documented recurrent life-threatening ventricular fibrillation and ventricular tachycardia but only when these conditions would not respond to other available anti-arrhythmic drugs and therapies. Amiodarone (Cordarone®) is considered so potentially dangerous that the FDA requires any person prescribed this medication to first receive a “Medication Guide” which is a unique direct-to-consumer warning to apprise consumers of the serious and deadly complications of the drug. While Amiodarone was technically FDA approved for a limited use, how it came to be approved is unusual. It was developed in Belgium in the 1960s to treat angina. In the 1970s some American physicians began obtaining Amiodarone from Europe and Canada to provide to their patients who suffered from life-threatening v-fib and for whom all other treatments had failed. Essentially, it was a “last resort” treatment. This use of Amiodarone was sanctioned by the FDA. Then in the 1980s, the foreign manufacturers of Amiodarone threatened to cut-off any supply to American patients unless the FDA approved the drug. Not wanting to take away the last potential treatment for many v-fib sufferers, the FDA acquiesced to these demands and granted Amiodarone a limited “special needs” FDA approval. In 1985, Wyeth received FDA approval to market and sell Cordarone® (Amiodarone hydrochloride) in the United States. But the special needs approval was only for use as a drug of last resort for patients suffering from recurrent, life-threatening ventricular fibrillation or ventricular tachycardia, and only after all other forms of treatment had failed. Thus, unlike other drugs, Amiodarone did not go through the rigorous pre-approval, clinical trials required of most drugs. And despite repeated requests by the FDA, the manufacturers of Amiodarone have refused to perform such clinical trials since it was approved. How do I know if I have an Amiodarone claim? If you were prescribed Amiodarone as a first line treatment for atrial fibrillation and developed pulmonary toxicity, pulmonary fibrosis or blindness you may have a claim. First line treatment means that Amiodarone was prescribed as either the first, or one of the first, methods of treatment instead of as a drug of last resort because other treatments failed. Additionally, those individuals who have taken the drug for a six month or more period are most at risk of pulmonary toxicity/fibrosis. If you meet this criteria, you may have a claim for compensation. What is a Medication Guide and What is its Purpose? In most cases, the FDA does not require the manufacturer to provide a direct warning to consumers and instead relies on physicians to use their judgment in providing appropriate warnings to patients. However, there are some drugs the FDA deems so potentially dangerous that this unusual direct-to-consumer warning is required. The warning, called a “Medication Guide” is a paper insert that explains in plain language information about the drug including all serious complications that may arise. The FDA requires Medication Guides to be distributed only with certain drugs when the Agency determines that: (1) certain information is necessary to prevent serious adverse effects; (2) patient decision-making should be informed by information about a known serious side effect with a product, or (3) patient adherence to directions for the use of a product are essential to its effectiveness. In this case, the serious, life threatening side effects associated with Amiodarone drove the FDA to require it be distributed with a Medication Guide. The purpose of the Medication Guide is to inform consumers about the serious side effects so that the consumer can determine whether the benefits of the drug outweigh those risks. The FDA requires that the drug manufacturer, along with the distributor and pharmacy, ensure that the Medication Guide reaches the patient. Are there any Amiodarone Lawsuits? Yes. Lawsuits have been filed on behalf of hundreds of Amiodarone users against the manufacturers of Amiodarone after atrial fibrillation patients developed pulmonary fibrosis after using Amiodarone. The suits allege the manufacturers failed to distribute the FDA required Medication Guide to the patients. Had the patients been warned of the life-threatening complications associated with Amiodarone they would not have taken the drug. Nor would these patients have taken Amiodarone if they had known it was not FDA approved for the treatment of atrial fibrillation. These lawsuits further allege the manufacturers engaged in illegal, off-label marketing by promoting Amiodarone for the treatment of AFib, for which it was not FDA approved. The suit also alleges traditional failure to warn claims that the manufacturers failed to warn users of the serious risks associated with Amiodarone use. All of these cases are still in the pre-trial stage. Amiodarone was originally manufactured and marketed in the United States by Wyeth Pharmaceuticals under the brand name Cordarone®. However, today generic Amiodarone is manufactured and sold by a number of pharmaceutical companies including Sandoz Pharmaceuticals, Novartis Pharmaceuticals, Teva Pharmaceuticals, Barr Laboratories and Par Pharmaceuticals. Most of the Amiodarone prescribed in the past 5 years are generic versions of Amiodarone. Therefore, you may not be aware of what brand of Amiodarone you have taken. But through your pharmacy records, pill bottle or even a leftover pill, we can identify the manufacturer. How did Amiodarone come to be used for the treatment of atrial fibrillation? Amiodarone was never approved for use as a treatment for AFib. However, because of the small number of patients that would fall under the actual approved use of patients with life-threatening VFib for whom all other treatment options have failed, Wyeth (the original US manufacturer) began to aggressively market Amiodarone as a drug for the treatment of atrial fibrillation which is the most common type of heart arrhythmia. Marketing or promoted a drug for a use not approved by the FDA is called “off-label” marketing. Not only did Wyeth begin to market Amiodarone as a treatment for atrial fibrillation it represented that Amiodarone should be used as “first line drug.” This means the drug is the initial, preferred drug for the treatment of a condition. Here because the approved scope of this dangerous drug was so narrow that Wyeth’s attempts to broaden its use to the far more common but less dangerous AFib treatment led to numerous warning letters by the FDA to stop the false and misleading promotion. It is illegal for any manufacturer to promote a drug for use not described in approved labeling of the drug. However, because persuading physicians to prescribe Amiodarone as a first line treatment for AFib meant billions of additional dollars in revenue, neither Wyeth or the manufacturers of generic amiodarone have stopped this improper prescription use. Is there a correlation between the dosage of Amiodarone and the risk of pulmonary fibrosis? Yes. The higher the daily dose of Amiodarone the greater the risk of developing pulmonary fibrosis. However, Amiodarone can cause pulmonary fibrosis at any dose level. Individuals at the greatest risk are those with a daily dose of 400mg or more for more than two months, or individuals on a dose of 200mg or higher for more than two years. There is also a correlation with age as the risk of pulmonary fibrosis increases with age. Thus, age of the patient, the dosage amount taken, along with the length of time the drug is used are all factors that affect the risk of pulmonary fibrosis. What is the prognosis of someone with Amiodarone induced pulmonary toxicity? The prognosis for individuals with Amiodarone-induced pulmonary fibrosis or toxicity is very poor. These are progressive diseases for which there is no cure. The median survival rate is only 2 to 3 years with respiratory failure being the most common cause of death. The earlier it is detected the better the prognosis. Indeed, if it is caught very early on, many patients respond well to the withdrawal of Amiodarone and the use of corticosteroids. If it is not detected until after permanent damage is done, patients end up with progressively worsening lung function. Most end up on full-time oxygen although the rate at which the disease progresses varies from person to person. Not surprisingly, the prognosis worsens with age as well. That depends upon the jurisdiction in which you reside and the particular facts of your case. However, typically each state has a two to three-year statute of limitation in which to file claims. Ideally, you would like to file such a claim within two or three years of being diagnosed with pulmonary fibrosis or toxicity, or, if the Amiodarone caused death, within two to three-years of the date of death. However, the particular facts of your case might allow the filing of a case even if the diagnosis or death occurred beyond a two to three-year period. Thus, even if you are beyond this time period you should discuss this with an attorney. If I have a case do I pay my legal costs up front? No. Our product liability attorneys will review your case free of charge. If it is determined that you have a potentially viable claim, we will represent you on a contingency basis wherein we pay for all costs. Only if we recover on your behalf are these costs repaid from the settlement or verdict. If we are unable to successfully prosecute your case you will owe us nothing. For more information and a private, no obligation consultation, call us toll free at 1-800-736-9085 or fill out the form below.